THE ORIGINAL FULL LENGTH AUDIO CD! All Materials on this site are Copyright © 2003-2006, Wendy Shadpour and MrQuizmee.com. All Rights Reserved. Quizzenkids, Mr. Quizmee Asks About...™ are registered trademarks of Wendy Shadpour. for "Mr. Quizmee Asks About Animals". 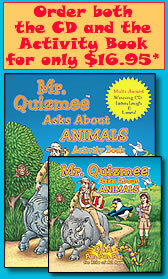 CD Cover illustrations and art for "Mr. Quizmee Asks About...Our Watery World"